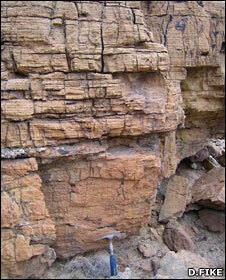 Traces of animal life have been found in rocks dating back 635 million years. The evidence takes the form of chemical markers that are highly distinctive of sponges when they die and their bodies break down in rock-forming sediments. The discovery in Oman pushes back the earliest accepted date for animal life on Earth by tens of millions of years. Scientists tell Nature magazine that the creatures' existence will help them understand better what the planet looked like all that time ago. "The fact that we can detect these signals shows that sponges were ecologically important on the seafloor at that time," said lead author Gordon Love, from the University of California, Riverside. "We're not saying we captured the first animal; we're saying they're an early animal phylum and we're capturing them when their biomass was significant." Researchers can usually determine the presence of ancient life in rock strata by looking for the fossilised remains of skeletons or the hardened record of the creatures' movements, such as their footprints or crawl marks. But for organisms deep in geological history that were extremely small and soft bodied, scientists have had to develop novel techniques to uncover their existence. One of these newer methods involves detecting breakdown products from the lipid molecules which act as important structural components in the cell membranes of animals. Over time, these will transform to leave a molecule known as cholestrane; and for sponges, this exclusively takes the form known as 24-isopropylcholestane. Dr Love's team found high concentrations of this biomarker in rocks located at the south-eastern edge of the Arabian peninsula. They were laid down in what would have been a shallow marine environment at least 635 million years ago. "Even though there must have been sufficient oxygen in the water to maintain the metabolism of these primitive animals, I think their size would have been restricted by oxygen being nowhere near modern values," the UC Riverside researcher said. 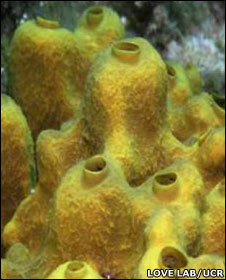 "We're probably talking about small colonies of sponges with body dimensions of a few millimetres at most. They'd have been filtering organic detritus in the water column." The discovery is fascinating because it pre-dates the end of the Marinoan glaciation, a deep freeze in Earth history that some argue shrouded the entire planet in ice. Scientists often refer to the term "snowball Earth" to describe conditions at this time. So to find animal life apparently thriving during this glaciation seems remarkable, commented Jochen Brochs, from the Australian National University, Canberra. "If there really was a snowball Earth, how did those sponges survive? The full snowball Earth hypothesis would predict that the oceans were frozen over by 2km, even at the equator," he told BBC News. "Only at hot springs could any organism survive but it is questionable that you would have sponges in a hot spring. I haven't made my mind up about snowball Earth but perhaps these sponges are telling us something about this glaciation." Dr Love's view is that the presence of these animals puts limits on the scale of the ice coverage. "I believe there were areas of what we might call refugia - areas of open ocean where biology could go on. And in this case, it could be evidence that we had some sort of evolutionary stimulation of new grades of organisms as well."